The word conjures up images of wildness, wilderness, mountains, glaciers, fierce winds, cascades, unusual animals and incredible strength and perseverance from the earliest indigenous people to the residents of today, and the adventurers who test themselves in this remote and incredibly beautiful region. I arrived in Torres del Paine National Park (Chile) on November 18 (flying from Johannesburg South Africa, through Sao Paulo, Brazil and Santiago and Puntas Arenas, Chile, where I picked up a rental car), and was greeted by this view. The rental car agent told me to ALWAYS stop (park) headed INTO the wind; otherwise it would rip the door off. I could barely get the door open to take this picture – winds routinely get 40mph, and often a lot more. In addition to the wind there are days on end with rain, so some visitors never see anything – terribly disappointing after such a long journey. I had good intel from climbing friends who had been tent-bound for days, so I allowed 25 days (most “tourists” try to see it all in a week – 10 days at the most). It worked, and I was lucky – only two days (so far) were totally weathered-out, and the forecast is decent for my remaining two days. I’m now going to treat you to a series of pictures following (approximately) my itinerary, with a minimum of commentary, and then a few at the end where some blah, blah, blah’s are necessary to understand what you’re seeing. These Condors had me worried – it was a long hike in, and I was wondering if they thought I was really tired, but it all worked out. These Guanaco are related to Lama’s, Alpaca’s and Vicuna; all of whom are Camelids (google can help you if you’re really interested) . This curious critter is a “Hairy Armadillo” – quite rare and endangered in this region – he/she crossed the road right in front of me and I got a quick shot before it scurried away. Los Glaciares National Park in Argentina is immense. The Southern Patagonia Ice Field is the third largest on the planet, after Antarctica and Greenland. It covers Patagonian Chile and Argentina in one vast area down the spine of the Andes. This glacier; Perito Moreno (named after one of the early Argentinian explorers) is one of the few glaciers in the world that’s stable, and it obligingly “calved” for me. The next day I took a (guided) Kayak tour to the face of it (staying a safe distance, of course 🙂 ). This is the face we were exploring – about 50 meters high. The next stop was at a remote Estancia (a former sheep ranch; now in the National Park; founded by a family from Finland in the early 1900’s. A breathtaking location, on a large lake (Lago Viedama) with a majestic view of Mount Fitz Roy about 30km across the lake. The wind is so fierce here that the trees (Sequoia’s actually; brought down from California) clearly show the wind direction. Lago Azul is a marvelous glacial lake above the Estancia – 7km one way, and 680m above the Estancia, but, fortunately for me, the horses took us 5km, and we “only” had to hike up 300m. It was sure worth it. 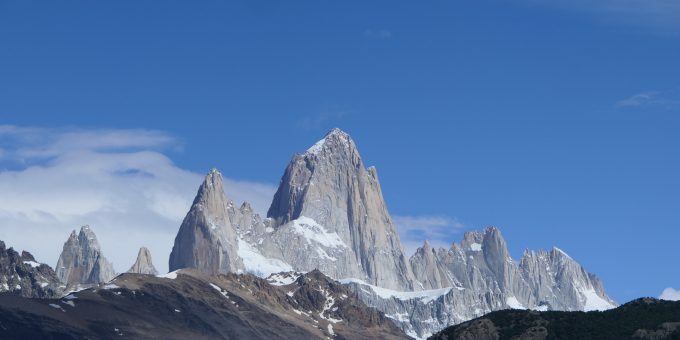 The next (and last) stop was in the little climbing / trekking village of ElChalten – home of the legendary Fitz Roy (right) and the Cerro Torre Massif (left) – Incredible ! Another short hike to Torre Viewpoint; overlooking both Cerro Torre and Fitz Roy – 3km (one way) and 250 m elevation gain, but, just like Lago Azul, really worth the effort. One last effort, to a Glacier 37 km north of El Chaten (by car) and then another challenging, steep hike to Glacier Huemul. A stunning lake and Glacier, and a view to the back side of Fitz Roy. Two more days here in El Chalten, and then, on the 13th off to Antarctica and Tierra Del Fuego – Happy Holidays to all of you, and a very Happy New Year. I’ll be back in Taos January 7th, and shortly thereafter (I hope) with the final chapter of this incredible trip – stay tuned. It’s a shame the view isn’t better. The view was OK; just needs a better photographer – perhaps should take Jimmy’s Masters Class ? George. Quite a trip but I notice your fellow paddler isn’t wearing gloves or a hat and you are wrapped up like a Xmas present. Was that the guide’s precaution to make sure you return to sender? Otherwise you look the rugged pioneer to a T.
Claudia was a “guide in training”, looking after the octogenarian, and had to demonstrate her toughness to the people that were monitoring her, and make me feel secure that her hands didn’t slide out of the mittens is she had to pull me out of the drink. A sudden squall came out of nowhere (Patagonia Weather) that flipped one of the kayaks, but the Zodiac “mother ship” fished them out quickly. It sure was fun, and I’m signed up for Kayaking in Antarctica. Thanks for these stunning photos, George. Such majestic raw young mountains and glaciers. What a trip for you. Where is next? Wonderful pics and explanations George! Thank you for letting us travel with you. Thanks, Lauren. I hope all is well for y’all and that you had a great summer.